I’m a firm believer that you shouldn’t lend money to anyone for a personal reason. Lending to a business is an investment, and should be treated like an investment, but lending to a friend or family member is different, and should not be treated as an investment. The reason this topic comes up at this time of year anyway has to do with paying for college. Right now, high school students are graduating and are looking at how to pay for college in the fall. Sometimes (and more often that it should happen) friends and family get wrangled into this conversation and end up lending to a family member. If you are going to lend money to family for whatever reason (be it school or to start a business), this is the smart way to do it. Say your best friend just started an awesome business, and he asked you to contribute some start-up capital. I consider this to be a reasonable request – you never know, the business could be the next Facebook, and you could retire as a billionaire. However, in the meantime, you need to ensure that you are protected. If you are lending money to a startup, establish what you will receive in return. Ownership, profit sharing, anything? Make sure that your rights as a founder are clearly written out in any start-up documents. This could be the LLC or Corporation paperwork, or it could be a simple signed agreement among partners (if a partnership). Whatever the business legal format, make sure that you and all partners agree on how the ownership will be divvied up, and make sure everyone has a signed and notarized copy. Any well written, signed, and notarized document could be used to establish ownership rights, but a great source for pre-written documents is Nolo. Nolo provides high quality documents that make it easy to establish ownership rights within a startup. It’s important to note that if you’re providing money in exchange for a share of ownership, then the only way you’re loan will be repaid is if the business prospers. A more typical loan would have a repayment period, an interest rate, and perhaps some sort of collateral. Before lending money to a business, you should have all the information in writing, and the contracts should be notarized. Before investing in a friend or family’s startup business (or lending money to their business), consider whether or not you can emotionally handle not being paid back. All loans come with the risk of default, and all investments can go to zero. This is particularly true in the startup world. A startup business may fail, and you don’t want your relationship to fail with it (and remember, 80% – 90% of all startups do fail). If you don’t believe that you could forgive the loss of the investment, it’s better for everyone if you refrain from lending money. It may seem discouraging or mean to say no to friends or family members, but it’s better to say no upfront than to see a relationship dissolve because you didn’t say no earlier. If you’re interested in lending to a startup business, but you don’t want to back your friends, consider looking at online sites like Prosper or Lending Club, which allow you to loan money out, set the interest rates you are willing to accept, and diversify among multiple startups. They are great ways to supercharge your cash returns, but you need to remember that all loans come with a risk of default. To lend to more established business, consider purchasing corporate bonds or corporate bond funds. Corporate bonds are loans to more established companies. Large companies use corporate bonds to raise money for a capital intensive project when they don’t want to water down the stock value by issuing more stock. Corporate bonds give investors cash flow opportunities, but highly rated bonds often have low interest rates. You can research and buy corporate bonds through Scottrade and other online stock brokerages. Lending money to help out a friend or family member in need is an even trickier situation. On the one hand, you don’t want them over-drafting at their bank, going into credit card debt, or pawning their best possessions, but in most cases you won’t have any way to guarantee that your friends or family member will pay you back. Some experts suggest that rather than lending money to friends or family members, you should give them money as a gift. That way you can protect the relationship, and limit your losses to what you can afford to give away. Other financial experts believe that it is sometimes appropriate to lend money to family members, if you may have good reason to believe that your friends or family members will pay you back. For example, if you have a sibling who needs money to pay for college, you may be willing to lend them money at a better interest rate than the government or private lenders will give to them. In another scenario, a friend might be feeling a cash pinch during a major life transition, but once they are back on their feet, you trust that they will pay you back in full. In these circumstances (and many others), it may be worthwhile to lend money to a family member or friend. Do You Care If The Money Is Paid Back? Before you lend money to a friend or family member, ask yourself if you still care for that person if you never see the money again. If you can’t honestly answer yes, then don’t lend the money. However, if you do decide to lend money to a friend or family member, treat the loan like a serious financial transaction. A loan to a family member or friend should not be a handshake deal; to protect yourself you need to formalize it. Even if you’re loaning a few hundred dollars without interest, it’s worthwhile for both parties to treat the loan like a business deal. Set an interest rate and repayment terms that you both agree are fair, and sign documents that spell out terms and conditions of the loan. 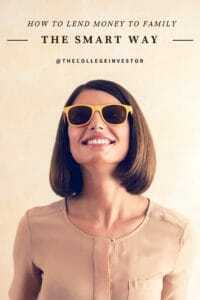 You may even want to consider collecting collateral, similar to a regular lender. For example, you can ask to be on the title as well, and then transfer the title once the debt is paid off. That way, if they don’t pay, at least you have ownership in the asset as well. If you’re lending a large amount of money, consider prepared documents from a site like Nolo to be sure the contract holds up to legal scrutiny. You may even want to sign the contract in front of a notary public. That way they signing of the paperwork is even more legitimate. If either party is unwilling to formalize the agreement, it probably means that the loan isn’t a good investment. In that case, you can either point them towards Prosper, Lending Club or their bank or credit union for a personal loan. If they are looking for money to pay for college, send them to sites like Credible, where they can compare lending options for student loans and even personal loans. Lending money to family and friends requires careful navigation through dangerous waters. It may be better to say no than to risk harming a relationship over lost money, but if you do decide to lend, be sure to lend money the smart way. Readers, what are your thoughts on “smart” lending to friends and family? I think the “smart” way to lend to friends and family (or anyone really) is not to do it. Being in debt is not a good feeling, and I wouldn’t want to help someone accomplish that. That is probably the safest way to go. Yep. A loan to a friend or family member should be thought of as a gift, unless you take possession of some collateral or formalize the agreement. Otherwise expect to go to small claims to garnish their wages. Brutal – would you really take a family member to small claims court? I don’t really lend to my family, any money I give them I don’t expect to get back but and i consider it a gift, if they want to pay me back they can. They are usually very good about it but I don’t ever bring it up again after I give them the money. I send money home for my family maintenance. My parents are retired and I help them. I don’t expect them pay back. On the other hand, I always put it in my to-do list to collect money lent out to friends, I always get it back. I have lent money to friends and family in the past without problems. I can’t really see myself doing it the “smart” way because I would feel embarrassed asking a friend to sign a contract or a document for how much he would owe me. It’s definitely the smart thing to do, but I would probably rather not lend money at all than to ask a family member to sign a document.